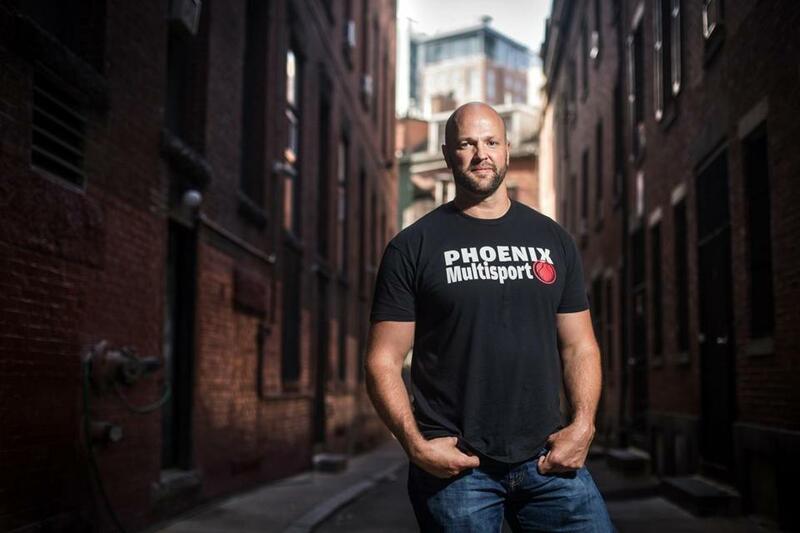 Scott Strode, who founded peer-to-peer recovery organization Phoenix Multisport after getting clean, pictured in an area in Boston where he used to buy drugs. Scott Strode feels he has something to answer for in Boston, an atonement for some mischief he brought on the city 20 years ago. In the mid-1990s, he caroused on the streets of what was then known as The Combat Zone, bouncing off the sidewalks just as the neighborhood was trying to dust itself off and get rid of types like him. He worked in the Charlestown Navy Yards, lived above a bar, and became one of his landlord’s best customers. Strode plagued Boston with his lurid lifestyle, he said, waking up oblivious from binges of crack cocaine and booze, then trying to find his way home before dawn. That would have required him to actually know where he was upon waking up, and many times he didn’t. Years later, amid a surge in deaths from heroin-opioid overdoses in Massachusetts, Strode wants to make amends to the city, in a manner of speaking. 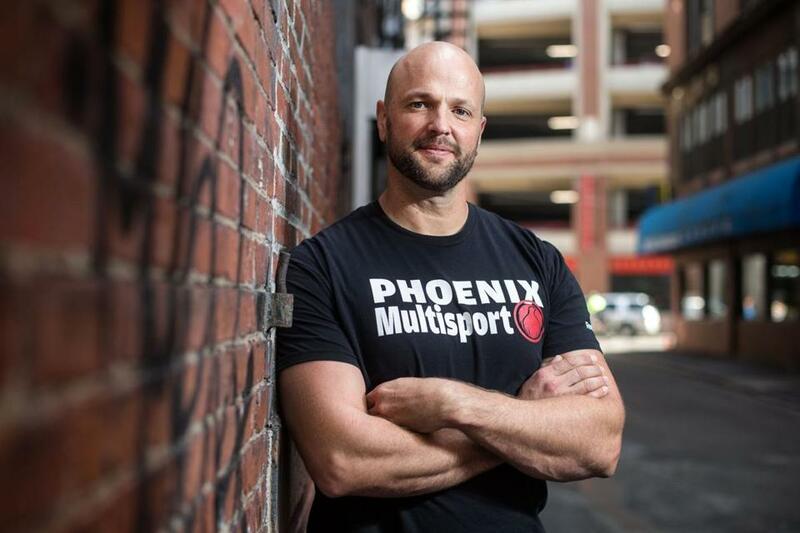 Eight years ago in Colorado, he founded a peer-to-peer recovery organization for young addicts called Phoenix Multisport. It has served 15,000 recovering addicts and has a first-time relapse rate, Strode said, of 23 percent. The national average, according to the National Institute on Drug Abuse, is as many as 60 percent of first-time rehab patients relapsing. Strode is bringing Phoenix Multisport to Boston. Phoenix was born in Boston, Strode said. That’s where he rose from the ashes. He had his last drink April 8, 1997, and on April 9 he was in a boxing gym in Kenmore Square sweating and pounding his gloves on a bag in the first steps to getting clean. Strode said Phoenix raised $250,000 for its facility here and received a $250,000 matching grant from The Lynch Foundation. When the program is in place, it will be free. The only requirement is that addicts must be sober and clean for 48 hours. The typical clients have been drinking and drugging since they were in their early teens. While searching for a permanent location, Phoenix has begun holding classes and activities around the city: hikes in the Blue Hills, walk-runs on the Charles, CrossFit classes in the Back Bay. Strode cautions that Phoenix isn’t a replacement for a 12-step program. Rather it helps recovering addicts cope and connect with those who have similar goals: staying sober and being active. Phoenix has three facilities in Colorado (Boulder, Colorado Springs, and Denver) and one in Orange County, Calif. In May it had 1,000 active clients. Phoenix uses high-adrenaline sports — boxing, rock climbing, mountain biking, CrossFit — as a bridge to recovery from the highs of drugs. His instructors, all recovering addicts, show addicts the way up the side of a cliff with a rope and harness, and how to dash through a rock-strewn landscape on a bike in the hills. They give tips on boxing and using a punching bag and how to set up a rigorous CrossFit training program. The idea, Strode said, is to build a new identity and self-esteem through the workouts and do it with the help of somebody who has been in the abyss of addiction. “What makes it so powerful is they know we have been there, right where they are,” said Strode, who had his first drink when he was 11 and his last when he was 24. “Even if we don’t talk about it, that’s the foundation we start from, which builds an understanding of each other immediately. We view each other as peers, we don’t have a hierarchical setup where I am the clinician. Strode, 42, started working on Boston ships when he was 17 as part of a semester-at-sea program for troubled youth. That turned into a four-year hitch. He came ashore for good in Boston when he was 21 and was in the throes of alcohol and drug addiction. Once he made the decision to get clean when he was 24, he immersed himself in the outdoors. Strode said he remembers his first time ice climbing in the White Mountains of New Hampshire and the instructor effortlessly scaling the vertical wall. Strode struggled, which he says is the secret sauce to Phoenix. Scott Strode, of Phoenix Multisport, posed for a portrait in an area where he use to buy drugs before getting clean. Mario Rossi, who was a Phoenix client and is now a full-time instructor in Denver, crossed a line with his drug use and overdosed twice. He has been clean for three years. When Rossi, 26, sees teenagers or 20-somethings come through the Phoenix door, he sees himself. Phoenix Multisport wraps its arms around these desperate ones. The climbing and boxing and biking and weight lifting are sparks, but the embracing, nurturing ethos of Phoenix is the true medicine. “It is more about the community. It wasn’t exactly the high from rock climbing, or CrossFit, it was more the new group of friends that put me in a more positive environment,” Rossi said. “We introduce people to these sports so they can come together with a group of people trying to build lives in recovery. Strode said Phoenix Multisport is not a residential program and is completely voluntary. His staff does not drag unwilling team members up the side of a mountain. The idea of resetting one’s boundaries through physical activity is not new, said John Heil, a clinical psychologist and former president of the American Psychological Association’s Division of Sport & Exercise Psychology. Heil, who has conducted “High Ropes” clinics for executives as company team-building exercises, said the key to the successful program is the implementation. Based on his knowledge of programs similar to Phoenix’s, he said the program’s principle is fundamentally sound. Ray Glier is a regular contributor to youthtoday.org. He can be reached at rayglier@att.net.